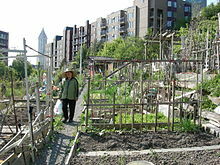 This is a fascinating community garden for senior Asian gardeners. It has been the recipient of many University of Washington design/build projects including the ADA garden spaces and “One Heart-Mind One Spirit” wall build by Jack’s nephew Jay. The garden is the center of a very strong community.